Follow the Twitter conversation from the conference under hashtag #reachingreaders. 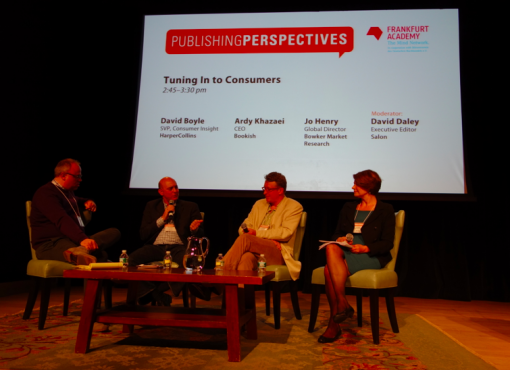 During the first half of Publishing Perspectives’ “Reaching Readers Conference” on Tuesday, panelists posed challenging questions against the backdrop of even more challenging statistics: Last year, $170 billion was spent on direct marketing and only a fraction of that reached potential readers; and only 7% of “word of mouth” marketing, arguably the most effective means of message spreading, happens online. What are marketers supposed to do? Different morning panelists struggled to differentiate between the efficacy of traditional marketing campaign environments and their counterpoint, the crowded digital landscapes that are soaking up their precious resources. The balance between authenticity and marketing in the social media place is a hard one to navigate. Morgan Baden, social media director at Scholastic, diplomatically ducked naming some annoying-on-Twitter authors who are so, ahem, prolific, that she bailed on following them (my neighbor to my left and I put ten bucks on @SusanOrlean…or maybe @MargaretAtwood?). The theme of self-promotion in Social Media to reach readers drifted in and out of the morning. 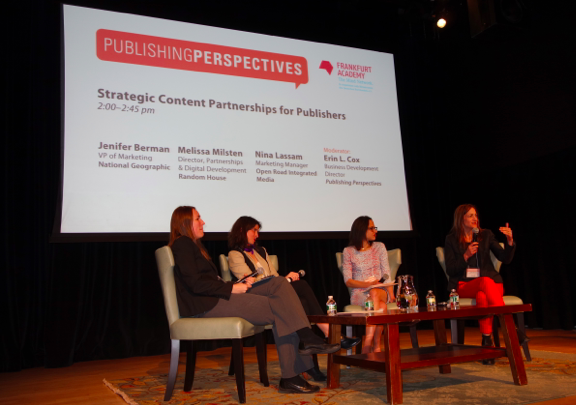 One panelist expressed the need to “pipe content” to where readers already are rather than create a new space for them. Moderator Andrew Losowsky posed an evergreen question: “Which voice do you utilize when you write from your platforms: First person plural or singular? Third Person?” Scholastic made a good case study for the under-18 set in that they use their Facebook space to talk to parents and teachers, and their Tumblr space to appeal directly to teens. If you’re just getting started with your Social Media strategy for a newly launched brand, Martina warns that it’s not advisable to race into every social media platform that there is for fear of sounding too market-y, and losing site of the genuine communication with your desired demographic. Start small and grow strong before expanding into a new space, seemed to be the consensus. Mark Gompertz, who’s been with Hearst Magazines expanding their brands for the last seven months, approaches the idea of brand expansion with the unusual confidence of having 20 fluid national consumer magazines beneath his wings, and described how they’re using consumer confidence and even reader-generated content from their brick and mortar magazines to launch new brands such as “Seven Years Younger” a co-mingling of Good Housekeeping’s Seal of Approval and the 46 brands that they deemed worthy of the seal (Hearst launched their brand with a book of the same name). For the more analytical set, Steve Rubel, Chief Content Strategist from Edelman, asked the audience to consider his overlapping (lucky!) clover equation during his presentation “The Content Imperative”: Traditional media (NYT) + Hybrid media (HuffPo) + Owned media (Starbucks) + Social media (Facebook) = enough placement in the field. He suggested that in the crowded marketplace, it’s wise to consider approaching traditional struggling media hubs for content partnerships, and used the Associated Press as a case study for a stalwart 100-plus-year-old journalism anchor that’s branched out toward Sponsored Content just to survive the economic realities of the climate. In a nutshell, in a world where newspapers are going on sale for dimes on the dollar, real estate is available — and rents are cheap. The second model is to weave the sponsor into a broader narrative, ala Buzzfeed. It is “product placement” for the Web. Again, there can be backlash to this. Rubel’s favors a model that employs a “co-creative approach.” This is when you sponsor an entire vertical channel on an existing media site . “Here, you have a win-win-win. Business Insider is doing a lot of this type of work [such as this example, in which Chase Bank sponsors a category of articles about small business], which is inside its editorial mix,” said Rubel. “The pros are that it’s like a media buy. The model is clean and offers a lot of control and there is a trust surplus. Cons: “These can be expensive and you still have no daily control over editorial, so it can be distant from your product.” How expensive and how long? $200,000 and a six month commitment, to start. “Content is still King,” but you can’t wait for it to come your way. Publishers have to aggressively court solid content, and be smart about investing their precious marketing dollars in it. Random House knows this, and disclosed that they hire journalists (real journalists!) to work on their aggregate themed verticals, such as Biographile.com, their website dedicated to biography and memoir. “It’s a lot of heavy lifting, setting up and building a vertical’s infrastructure, so you need to make sure you’re utilizing it,” said one panelist. The hardest part for publishers, so far, is “working it into the workforce” of busy editors, said Rubel, who are also presumably repurposing content for other platforms like tablets and now, more than ever, mobile platforms. Jeff Yamaguchi, pointed out that at the same time, while the marketing departments of publishers want “content and more content” to promote a book the “challenge for the authors of books is time management.” The answer is planning: authors really need to start thinking about this nine months before, plan for it and be ready so they are set well before the book comes out.